We finally got it. We have been begging a few of the girls’ audiophile husbands to see if they can get a copy of this record. Sure, googling it will bring up a mention in some program called Tosh.0. And many websites have cited the record’s amusing title, but has anyone ACTUALLY heard the music on this recording? Well here is your chance! 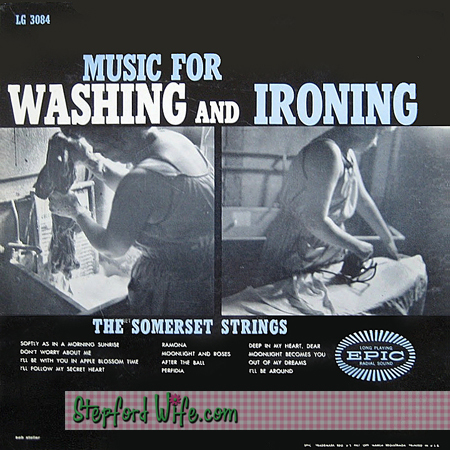 The women at Stepford Wives Organization is proud to present our digitized track (oh alright, Edwin hunted it down at a garage sale and James gets the credit for digital conversion, whatever that means) from the record Music for Washing and Ironing by the Somerset Strings. EPIC LG 3084. We warn you, it’s a bit scratchy, but what did you expect for something over 50+ years old!? Click on the record cover above or here to play the mp3. The therapeutic value of certain music has been known for a long, long time. Wily old Congreve was the man who noted that “music hath charms to soothe the savage breast,” but the concept goes much farther back into history than that. More recently, music has been used to keep employees happier (and in some instances, busier) at their work, and the introduction of a radio program called “Music to Read By” has led to a series of programs presenting music for specific moods and/or occupations. In the instance of this particular program, it matters little whether or not one is washing or ironing; the music is delightful on and terms. Nevertheless, if there is work to be done, it is certain that the burden can be eased by such gracious and appealing melodies as The Somerset Strings present in this collection. Sorry, if you were expecting Mad Men’s Washing Machine with Betty Draper! That featured music was done by Astrud Gilberto from her song Agua De Beber, and will certainly prove too distracting to get your tidy whiteys brilliant. Now enough chatting, we need to get back to washing and ironing and cooking!